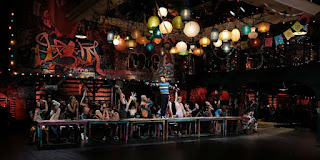 The show must go on, and it did this past Sunday with FOX’s semi-live production of the Tony Award winning musical RENT. There are already scores of articles debating the choice to air pre-recorded footage of the musical due to cast member Brennin Hunt’s last-minute injury. Some were fine with the choice, while others called out the creative team for poor planning (Hunt did not have an understudy). The one thing everyone can agree on is that the decision to reunite the original Broadway cast with their 21st century counterparts for a finale tribute to RENT creator Jonathan Larson was truly fitting. Larson never lived to see the musical’s first off-Broadway production, let alone the tsunami of success his work has wrought. Not only did the musical catapult the careers of its original cast, but it became one of the most recognizable and impactful musicals in modern history. RENT was Larson’s masterpiece and passion project. It was his way of giving a shouting voice to a generation being told to hide in the corner and be silent. That was what it was in the 1990s, but what does it mean today? To the Gen-X and early Millennial generations, RENT was the musical we needed to hear. It’s as ingrained in our memories as the rise of N.W.A., Green Day, and the Dawson’s Creek theme song. All contradictory phases in pop culture to be sure, but nevertheless, all important markers of the late 80s and 90s. Many of this generation are now parents themselves, some to teens and preteens who like to say things like, “Mom, that music is so old.” [Insert outraged emoji here.] But many of these comments come from a lack of understanding of where these artists and phenomenons came from. RENT specifically came out of a generation that was not only being stigmatized and discriminated against every day, but people who were quite literally staring death in the face. Gen Z has their own social issues to contend with, but in many ways, the coping mechanisms have changed. Each generation has its own social issues, of course. For the Baby Boomers, they were the social justice fights of the 1960s and the Vietnam War. For Gen-X, it was the AIDS epidemic. For Gen-Z, it’s mass shootings. This might seem like a gross oversimplification of the progress and history of the late 20th and early 21st century of Western civilization (especially in the context of musicals), but bear with me for a moment. Each struggle was tangled up in a fight against discrimination and bigotry, but the HIV/AIDS crisis had a deeper layer to it. Not only did it place an increased stigma specifically on the LGBT community because of years of ignorance about the virus, but HIV was quite literally a death sentence for a decade. It took years — and far too many lives lost — to create drugs capable of effectively combating the virus (a fact confirmed in RENT). It took far longer for those who survived to shed the false and bigoted labels that came with an HIV diagnosis. Larson knew that, and he knew how important it was to put specific words to the indescribably pain of many. But what really made the first incarnation of RENT so indelible in our minds is a spirit of friendship — of hope in the face of the disenchantment with the establishment and, above all else, making the most of love. Live or not, I believe FOX’s version pulled that off. You could see it in the joy and charisma Valentina puts forth from that very first pose of “Today 4 U.” You can see it in the instant connection between Brennin Hunt and Tinashe’s Roger and Mimi, which was palpable in one of the only live scenes of the broadcast: “Your Eyes.” And don’t even get me started on the masterful complexity that was the work of Vanessa Hudgens, Jordan Fisher, and Brandon Victor Dixon — all of whom turned out performances that you could feel coming from the inside out. The mark of a great performance isn’t just in the strength and caliber of the performer, but whether the performers themselves could feel the power in the work they were tasked with. Every single RENT Live performer did that. You could tell they loved what they were doing, and took their place in this show very seriously. 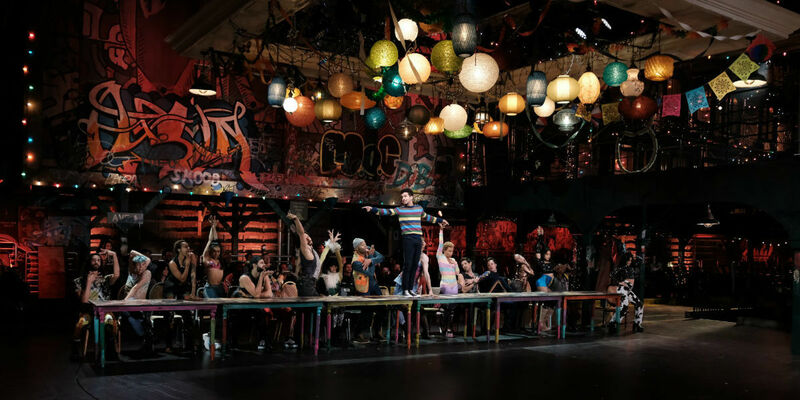 One of the hallmarks of RENT that made the musical successful is that it was set in a time and place where there was no escape from the struggle, except in defiance. By defiance, I don’t mean rioting or protesting, although that certainly has its place in the story. Defiance in terms of refusing to accept the hand you have been dealt until you absolutely have to. Defiance in terms of not giving into despair and reveling in the things you do have — such as your individual power, willingness to accept vulnerability as a strength, forgiveness, and ultimately, your voice. In other words, the ability to embrace what is and what could be, instead of hiding in the shadows; or in the case of Gen-Z kids, technology and its many false escapisms. So to anyone who wants to quibble over the power of live versus semi-live broadcasts, I ask you to put that question into the “What’s Done is Done” category, in favor of a more important question: Can a new generation learn from Larson’s work? Can they learn about that time, and apply Larson’s message to a new road forward? Can they be taught to stand tall together like RENT’s ensemble during “Seasons of Love,” instead of hiding in cyberspace? It certainly answers the question of how to explain the musical’s importance to today’s youth. Because anyone who believes that the HIV/AIDS epidemic has been eradicated in the United States isn’t paying attention. Anyone who believes that racial discrimination, homophobia, and homelessness is another person’s problem has their head in the sand. Just because we have made progress in the last two decades does not mean that Larson’s work is finished, and that is why RENT Live was a necessary production that deserves commendation. we can learn from those who stare death in the face every day.